The new Epson PowerLite Home Cinema 3010 is the company's first 3D projector to reach the market, and it is causing a lot of excitement in projector circles. Even more interesting is the companion model, the Home Cinema 3010e, which offers a robust wireless capability across a good-sized room. 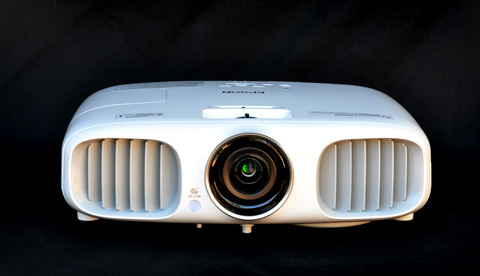 The Home Cinema 3010 is a bright home theater projector, rated at 2200 lumens and 40,000:1 contrast with an auto-iris. It is ready for 3D projection right out of the box, with a built-in 3D infrared emitter and two pairs of glasses included. The 3010e adds wireless HDMI capability, but does not include glasses, for an additional $200. The Home Cinema 3010 is also a bit of a departure from Epson's existing home theater line, as it includes neither the 2.1:1 zoom lens nor the extensive H/V lens shift range for which they have become known. But at $1599 ($1799 for the "e" model), the Epson Home Cinema 3010 is one of the least expensive full HD 3D projectors on the market. 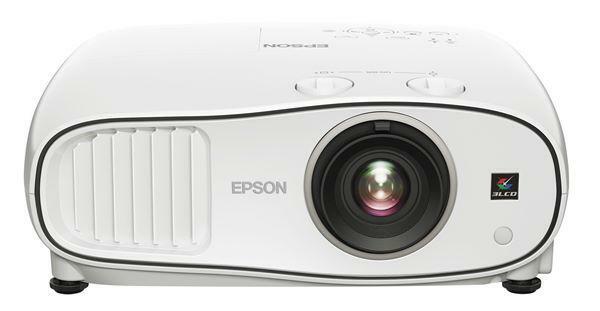 For those who want an entry-level 1080p 3D projector, the Epson Home Cinema 3010 is an attractive option. We set the Home Cinema 3010 on a rear shelf in our theater, turned it on, and immediately discovered two things: one, that the Home Cinema 3010 is very bright, even in its Cinema mode, and two, that it does not have lens shift. Instead, the Home Cinema 3010 has a fixed throw angle such that the bottom edge of the image is level with the centerline of the lens. This makes a rear shelf mount all but impossible without keystone correction, unfortunately, unless you mount the projector to the underside of the shelf, upside-down. A ceiling mount will likely require an extension tube, while a table mount might necessitate keystone correction. Keystone correction, incidentally, is something the Home Cinema 3010 is quite capable of. 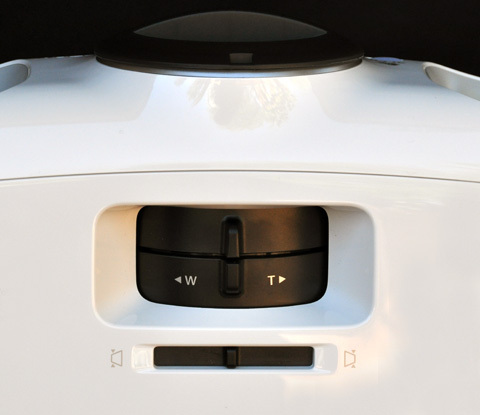 In addition to automatic vertical keystone, the 3010e has a quick-adjust horizontal keystone system activated by a slider on top of the case. Using this slider, it is easy to square the image with whatever surface you happen to be projecting on. All of the usual concerns about keystone correction still apply, though: it reduces usable resolution of the projector and causes a loss of detail in the projected image. The ideal mount is one where the projector requires no keystone correction at all. In our darkened theater, the Home Cinema 3010's Cinema mode was too bright for our 1.0 gain 120" diagonal screen. The 3010 cranks out 1373 lumens in Cinema mode when using the lamp's Normal (full power) setting and the wide end of the zoom lens. Switching to Eco lamp reduces output by 31%, which brings output to 947 lumens on our test sample, while the 1.6:1 zoom lens only loses 5% of total light over the entire range. In the end, using the Cinema preset in Eco mode with the lens at the maximum telephoto setting produced 899 lumens on our test sample, which is still awfully bright for a 120" diagonal screen in a darkened theater environment. For reference, the SMPTE recommended brightness for a 2D image in a darkened room is about 16 foot-Lamberts, and this combination gives you 21 fL. What's more, this is as low as light output will get on the 3010. On the other hand, if you're planning to watch a lot of 3D, you have to plan for the brightness loss that occurs when viewing 3D movies. A 140" diagonal screen, seen through the 3010's active shutter glasses, gives you a mere 3.6 fL using the 3D Cinema preset. For reference, the SMPTE recommendation for 3D is no fewer than 4.5 fL in a commercial theater, and it is generally acknowledged that brighter would be better. If you are going to watch a lot of 3D, you may want to stick with a 120" diagonal screen, which will give you 21 fL in 2D and 5 fL in 3D. You could also use the 3D Dynamic preset, which boosts 3D brightness enough to give you 7 fL on a 120" screen or 5 fL on a 140" screen. These numbers are meant as a guideline, not a hard rule; using a higher-gain screen will skew the calculations, as will any ambient light in the room or the normal dimming of the projector's lamp as it ages. The ideal 2D viewing environment for the Home Cinema 3010, then, is either a room with some ambient light and a 100" to 120" diagonal screen or a room with no ambient light and a 140" diagonal screen. The former is a great choice for home entertainment, while the latter is better for the cinemaphile who wants to get into 3D without breaking the bank. With the brighter image modes like Living Room and Dynamic, you can use a smaller 80" to 100" screen and stop worrying about ambient light entirely. The 3010 produces an image that is vibrant and colorful. It seems that the image presets, especially Living Room and Dynamic, place special emphasis on high color saturation, to the point where using these settings in a darker environment can make them look almost cartoonish. In Cinema mode the effect is quite pleasant for games and sports, though a more film-like appearance can be created by turning it down a few notches. Detail in Blu-ray movies is clean and sharp, though the use of keystone correction will have a deleterious effect on detail sharpness. So it seems the 8350 is still the one to pick for a light controlled theatre room?? I'm currently building and was going to paint my room dark grey along with heavy block out curtains to minimise light... 8350 will probably still be preferable? Hopefully the price of the 8350 will drop as it will make it a more attractive option as I have no interest in 3D.. I was wondering about the zoom being less (1.6 vs 2.1) than the 8350. The projection calculator isn't up yet, so I checked out the owner's manual. For a 120" (16:9) screen, it shows a projection distance of 11.6 feet to 18.9 feet while the 8350's range is 11.8 to 25.1 feet. Is the 3010's owner's manual correct in stating you can get a 120" image at only 11.6 feet? Dear Bill Thanks for the review, as always the info is very useful. Still I am undecided between the Optoma HD33 and the Epson 3010. I saw some pictures of both on another forum and the picture quality and detail in the Optoma seems better, but I am a bit inclined for the Epson for the Split screen function, longer warranty and for the price with the two pair of glasses. I wonder if a future firmware may improve the actual crosstalk in 3D on the Epson. BTW, Bill I think you did not mentioned how the split screen feature worked on the review. To take care of the cabling I purchased a Vizio Universal WirelessHD kit (for less than $180) and it can be used either with the HD33 or the 3010. So I don't have to pay extra for the 3010e and loosing the pair of glasses. I will wait a few more testimonials of end users for both projectors before choosing the one, since there is another issue I have to take care of: "ceiling mounting". Additional feedback may help me decide based on flexibility for installation. Which of the two is more friendly with the following setup? A 120 diagonal inches screen (4:3 ratio, 1.3 Gain), natural light is under control thanks to a few curtains and my ceiling is 9 feet tall. Sadly I have one of the ceiling lamps from the room in the exact path between the projector and the wall where the screen is, so in the past with my previous projector I had to use a 10 inch extension to lower the projector according it offset and avoid interference. How will this change with either the HD33 or the 3010.
jas: The Home Cinema 3010 does not have frame interpolation of any kind in 2D or 3D. Luis: It's impossible to say with any sort of precision, since I don't know the size of the ceiling mount, the height of the fan, or the position of your screen. However, the HD33 has a 7% offset while the Home Cinema 3010 has a 0% offset. If you want to get the image lower on the wall in a 9'-ceilinged room, the HD33 will make that slightly easier. If I were you, I'd be more worried about throw distance; make sure the projector doesn't need to be too close to the ceiling fan. Thank you for the review! I'm new to projectors but I was hoping I would get one of these entry level 3D full HD machines sometime soon. I was wondering if projectors are software upgradeable. If they are, could 3D performance be improved with a future firmware update, to a point of course, that it would make you change its marks? Thanks for your review, but I am still a bit confused as I have a 133" screen but in a light controlled dark room. The review mentions the HD33 better for small screens in dark rooms and the 3010 for larger screens brighter rooms. I'm right in the middle. Any thoughts to help me decide between the two? Hello, Thanks for the review Bill, I've been looking forward to this projector for quite some time. I had one question in regards to the mounting. I have a 106 in. screen on my wall and my cables come out of the ceiling at around 13 ft. The ceiling is 8ft tall and the top of the screen is 12 in. from ceiling and about 2 ft from the floor. Will I be able to mount this without a tube? I have this setup in my family room and there are tables and seating behind where the projector mounts so a tube hanging down would definitely block peoples view of the screen. I was hoping to keep the projector relatively flush to the ceiling to avoid being an obstruction to view. Would I be better off going with the 8350 as I would like to avoid keystone correction if I can. Thanks again for all the help, it was a great review! The new Epson 3010 is a big dissappointment. 1. Has a crosstalk problem in 3D. 2. No frame interpolation system to smooth the image. 3. Lacks the contrast of its competitors. 4. No lens shift which makes placement difficult. 5. Too bright for a darkened theater, especially for a 120 inch 1.3 gain screen. Its physical appearance is better looking than the previous model. And, its great for big screen (darkened theater) instatllations in 2D or for a lights on social event. I can't believe Epson released this unit with its subpar 3D performance. This makes me believe the 5010 3D performance will be no better. To me, Epson took a step backwrds with this model.....unless all you care about is a super bright image with first generation 3D performance. I can't wait for the Mitsubishi HC7800 3D projector review and how it stacks up with the Panasonic. Basically, I need versatile projector that performs well in a number of areas. I don't plan to upgrade again for at least 7 years. I still have my NEC HT1100 projector (old technology (1024x768 resolution)). But, it looks better than my 1080p 40 inch and 52 inch Samsung LCD/LED TVs, which is mind blowing... Maybe it appears to look better than my TVs because its calibrated and because the screen size has that WOW factor....or maybe it's the NEC Sweetvision technology!...don't know. The only reason I'm looking to upgrade my projector is because I can't play blueray movies on it. If I want to watch a good movie in the theater room I have to get standard definition movies. They look great, but I prefer to by 1080P movies. My projector is making buy standard definition movies. I'm happy to see newer movies packaged in both standard definition and blueray. I just need to upgrade! Could this cross talk issue be similar to the rainbow effect where some people are affected, since some people seem to have no issues with the 3010 cross talk effect. I would think at least half the people thinking of a 3d projector would love to know how it does in gaming. For me its about the only concern. Until cable or dish start showing more 3d it becomes to expensive to just buy 3d movies. Please try to include gaming in 3d reviews, especially if possible pc gaming as it is the most capable of supplying a solid frame rate for 3d gaming. Thank you for this review, was totally disappointed to hear Epson's 3d wasn't up to the hd33, but it was helpful in determining to wait till we have a very bight projector with no cross talk.I own an epson now nad love it's broghtness, would buy a new one only for 3d capabilities, hopefully epson improves with firmware the 3d on this model or most likely will excell on their next model. Possible I missed it, but how is the projector on noise? Is it quiet or loud? Any intention to do a review of the 55 series? Yes, please include gaming in your reviews. The most important thing is to measure the input lag, with and without frame interpolation (moot point for the 3010 though). Most people get dizzy if the input lag is too high, as moving the mouse/joystick/whell/other controller should have a nearly instantaneous effect on the game physics. I currently have a Sanyo PLV-Z4, and am going to replace it soon. The 3010 is a good option, but I'd really like to know how it fares input lag-wise. 1) Many comments seem to reference a crosstalk "problem", but in my experience this is being heavily overstated. I've not used the HD33 so cannot compare to that - however, I've taken photos of the tests showing it to match or have a slight edge on my old pro350w (hd66 equivelant), and those things had a **TON** of happy owners. Both are vastly superior to what you'd see in a commercial theater. 2) Having said that, I have been disappointed with lag. 1080p@60 and 720p@60 both tested at about 60ms delay. Hopefully someone will find out that I've got something set wrong, but so far not promising there. So some good some bad. Overall I like it, and I'm enjoying gaming in spite of the lag, but I don't play many competitive FPS style twitch games. I'm a little surprised by your review. I got the EPSON 3010 on Monday and I've not seen any hint of 3D crosstalk in my viewing. I've been watching some 3D IMAX Blu-rays and they look amazing. I'd say the 3D is much better than many commercial cinemas that I've been to. I wonder if you had a bad projector, glasses or had something interfering with your glasses IR? I have max distance of 15 ft to place the projector. Waht will be the exact screen size? I tried HD33 but it is too small and want to try Epson 3010. I have to agree with you. I've just come off a weekend marathon of 3D Blu Ray content and I never saw any crosstalk. However, I'm projecting at only 97" or so diagonally and their review keeps mentioning 100-120", so I'm wondering if it's only at much larger projection that the CT is noticeable. But overall, I have only public theater 3D to compare this to, and it's blow my expectations away! I'm extremely happy with the 3D performance. So I'm considering this for my den. It's a multi-purpose room with dark walls, furniture and blackout curtains. Will a grey screen work with this projector or do I get a white screen? Also, are Tab-Tensioned Motorized Projection Screens suitable or must I go fixed frame? According to the manual, at 15 feet you can do anywhere between 100-150 inches diagonal (though 150 inches requires 14.6' throw distance) That's at 16:9 aspect ratio. Looks like Epson.com website decided to raise the MSRP of the 3010 to $1999 and the 3010e to $2199. See what a few good reviews will do? I hate when a company raises a price just because they can. I wonder if that would change any opinions in the shootout recommendation of the 3010 vs the HD33. How many crosstalk , see you on the 3-d picture's ? Is it correct that the Panasonic active shutter glasses work with this 3010 ? I´m buying extra glasses and the Panasonic look more confortable (has 3 sizes). I bought a 3010 from best buy. I asked the rep who was there if there was any other things i should look for or any special features of the 3010 I should know about. He didnt mention the 3010e however. Oh well. Would be nice to have the wireless hd one instead. Isnt that a reps job though? Tell you about the products and line up? I bought the 3010 from BB about 1 1/2 weeks ago, and LOVE it. Just got it officially ceiling mounted on Saturday, and while lens shift would have made it slightly easier, overall had no issue. Have seen NO 3D cross talk so far, and VERY impressed with black levels, etc (though I'm projecting on gray wall - eventually will sand and repaint using a more appropriate shade though). Screen size I'm using is 147" from 15' away. So, for those of you who have ceiling mounted, how far down must the projector hang in order to avoid using keystone correction. The instructions say the center of the lens should be aligned with the center of the screen. The center of my intended screen is about 42" from the ceiling. Obviously, I can't have a 40" tube. So, I have to use keystone correction? How much degredation in picture quality can you expect? What possible installation scenario could you have that WOULDN'T require correction (ceiling mounted)? Thanks. Look at the Distance calculator from epson ! This is my first projector and I must say the whole family loves it. I've got it set up in the basement with controlled lighting and have run it on a 0.8 gain high-contrast grey 106" Accuscreen fixed screen in Dynamic mode and it looks great with the lights off/almost off; and it still looks decent with all the lights on. The projector is mounted at about 10'7". I've had a few people over and no one has noticed any crosstalk issues - I've asked. I still have to tweak the color settings but out of the box it really is decent, the projector is really quiet as well. I noticed some gaming lag in 3D while playing Gears of War but it was only once or twice. As for 2D gaming, I haven't really noticed any lag in Gears or Call of Duty (as far as FPS go). All in all, we're really impressed with the projector for the price we paid. Still trying to figure out which glasses do work with it - on the Epson site it states M-3Di compatible Panasonic, Sony and Samsung glasses will work but they don't mention model numbers. I haven't had much luck with vendors as none of them seem to have heard of the M-3Di initiative. I'm told if the Panasonic glasses have the Full HD 3D logo on them then they work with the 3010. Is it better to buy the "old" TW5500 for me? I don't care for 3d and guess you need to spend more for a good 3d unit. Now it's not top on both 2 and 3d, i think the tw5500 is a far better at 2d and again i don't need 3d. The price of TW5500 dropped and it's almost the same at 1700 euro. So what's your advice for me? Epson does it again! Best bang for the buck! 1500 dollars well spent. Recently installed the 3010 in my light controlled theatre. It replaced a AE400. It is ceiling mounted and is projecting on a 120" Elite 1.1 from 14'. Worked great right out of the box. Much better and brighter picture that my old projector. However I have two major issued with this unit. The biggest issue in gaming lag. It is BAD BAD BAD. You can forget games like Rockband period... I was unable to play. The second issue was brightness in 3D. Not as bright as I hoped but OK. Other than that this projector is really good and a steal at 1499.00. The gaming lag is enough of an issue that I may have to replace it. A month late I know, but just saw this, I flipped out when I saw that in the manual too. I think its a misprint, center of lens should be at top edge of picture, or close. I used the drop pole that came in the sanus mount & it was perfect. The Epson 3010 projector ROCKS!!!! This is the 3rd projector that I have owned. The picture is absolutely unbelievable both in 2d and 3d Ceiling mounted. Set -up was really simple. I was pleased that it had 2 HDMI jacks as my reciever is not a 3d reciever and so when I was unable to view the 3d I realized that a second HDMI cable was needed directly from the bluray player to the projector as I did not want to upgrade it.So now all my other components like TV, Gaming etc are still being fed via my reciever and the 3d bluray goes direct. Center of lens needs to be at TOP of image, not center of image. I used a 5" drop and have no problems. Can anyone tell me if any of the new 1080p 3D projectors can handle nvidia's 3d solution. It was specifically mentioned the epson 5010 can not but I haven't noticed any mention about nvidia on any other of the new 3d projector reviews? gostaria de saber se posso usar os mesmos oculos tanto para assistir tv 3d e o projetor 3010 eles sao compativeis. I wonder if I can use the same glasses to watch both tv and projector 3d 3010 - are they compatible. saludos desde BOLIVIA, acabo de encontrar esta web, y estoy tatalmente facinado, con la tecnologia de EPSON, como me gustaria tener mas informacion del como adquirir este PROYECTOR 3D con los lentes incluidos... necesito saber el costo real incluyendo envio, ahora bien nose si hay en LaPaz-Bolivia para adquirirlo y que pasa si necesito lentes adicionales. me puedes dar alguna direccion para saber donde hacer mi compra? google translation to English: Hi, Bill Greetings from BOLIVIA, I just found this website, and I'm fascinated with state structures, with the technology of EPSON, as I would like more information of how to acquire the 3D Projector lenses including ... I need to know the actual cost including shipping, however if there are Nose-LaPaz Bolivia to purchase and if I need extra lenses. I can give some direction to find out where to purchase? Do also the NVDIA 3D glasses work? Is it possible to use Passive 3D Glasses on this Projector, did some one tried it???? Planning to get one for the basement. Greatly appreciate any input. BAD CROSSTALK (Ghosting). Those that say there is no cross talk with this projectot must be BLIND. Buyer BEWARE! This unit has SEVERE cross talk issues. I hope Epson fixes this with a firmware update soon. The 3D picture is unwatchable. However, the 2D picture is excellent. I watched 3D on the 3010 and 6010 and both had really bad image flashing. The image was far too unstable for me. I suggest people demo these things before they or makes sure you can return it. So if I'm understanding your comments about placement, even if I have the projector mounted upside down on the ceiling, 15 feet from the screen, I'd want to have the projector lined up with the top of the screen? Or is it OK to have it sitting a foot or two above the top of the screen? I have a 9 foot ceiling, but I'd want to have my screen's top approximately 6' from the floor. Looking to get the Epson 3010, is the 3d really great for this projector? Or am I waiting my time? We're considering putting a 3-D Epson, ceiling mounted, projector in our basement. Could anyone tell me how dark the walls should be for a "light controlled" atmosphere in this area? At its minimum, i AM Not a teck or anything such but i think this is what you are needing from what i've read. iMAGINE LIKE DUSK OUTSIDE. gET IT FROM DAWN TO DUSK. gOOD LUCK. Where did you find this for 1500? Can't fins it at that price anywhere! I just got the 3010 this past weekend and I have to say, I have not found a single fault with it. My previous projector was an Optoma EP721, which was my introduction to projectors in general. Having used that projector for 2 years and moving up to the 3010, I have a real appreciation for just how much better the picture looks. The setup was very simple, although not having a lens shift does hurt, but luckily it doesn't shoot anywhere near as high as my Optoma did, so the angle isn't as drastic. I've seen quite a few people say that there is crosstalk. So far I have yet to see it. I'm wondering if they mounted it upside down or something and the image needs to have the 3d reversed. There is a manual toggle in the menus that allows you to reverse the image. I have my sitting on a shelf and I decided to reverse it just to see, and at that point there was crosstalk. I've played both, Batman: Arkham City and Uncharted 3, on PS3 and everything looked perfect in 3D. Batman looked especially awesome because of the wide open city and the ability to soar above it. That brings me to my next point which is gaming lag. Everyone keeps mentioning gaming lag, but again, I can't seem to find it, in 3D or 2D. Performing combos in Batman requires pretty precision timing and I was able to pull off a 14 to more hit combo on a group of thugs with no problem. Playing Uncharted in 3D, again no issues, even with the timing on the reversals in melee combat. Gave the 3010 a run through on 2D with Battlefield 3, and aside from being blown to bits by cheap players and their shotgun/frag round combos, again everything was perfect. No delays between any button presses and on screen action. So again, I'm wondering, if it isn't something with the PS3 itself? Maybe a particular model # or the old fatty vs the new slim model? As soon as I changed my output settings on my PS3, it gave me a dialog that said something along the lines of "the display can receive 3D signals, what size is your screen." At which point I entered 71 inches and everything seemed to work fine. Maybe to help get to the bottom of the whole crosstalk/gaming lag issue, we should list our specs on our entire setup? I have a PS3 350GB slim model going out HDMI for video and the audio going out the PS3 cable to a separate receiver. My screen size is 71" and my throw distance is about 10'(I know, small room). Since I didn't know external links were forbidden, I'll just go ahead and list the glasses that have so far been proven to work and those that don't work. Thats all I could find listed for now. I'm not that concerned about 3D but thought it was a cool feature. The biggest selling point for me was the split screen feature, however it doesn't work with two HDMI sources! How stupid is that? All of the new laptops (like mine) now do not even had an RGB connector. I could use a USB video card but that defeats the purpose a buying a laptop with HDMI. I think I'm going to return it and pick up a 2D projector with comparable specs. I'm sure I can find one for 300-500 less. My old Epson projector just died so I was looking to replace it with this one. I just noticed, however, it does not have the 12v screen trigger output that my old one had connected to my screen. Is this true? and what are the options to trigger my screen otherwise? Anyone know? I have a new one. I'm rather satisfied with my new 3010. So there's a problem with 3D mode side by side, it lost signal 1 second in about 1 minute showing. I tried to change other function in menu but I can't fix it. In 2D or 3D up and bottom, the projector still working very good. Please help me solve that problem. Whiterabbit, try to change your cable to another with higer quality and designed for 3d, and shorter (3 ft.) It may help you. I was almost ready to but, but after reading all the reviews, I am confused, I have Direct-TV, as my service, they have 3-D channels, that are great on a regular 55 in. LG-TV how well do the look on this projector? Well, I purchased a Epson 3010, and after a little over a month, I can Honstly say I am really PLEASED, with all aspects of this projector- I am very, very happy with the 108o-I/P, very clear and honstly a great picture and the 3D is GREAT, really suprised at how good it really is. I got used to the 2D/3D conversion on my LG 55" TV, and I wish I had found the 1030E, before I purchased- I thought the 1030 all had it-I was wrong, wonder If I could get a update or something to allow 2D to 3D conversion?